Tobey Maguire’s taken a shot at portraying teen favorite Peter Parker. Now it’s your turn to take yours! Spiderman, a DC comic figure who was the first teen superhero of his kind, has transcended the comic book era to become famous in films, television series and more. 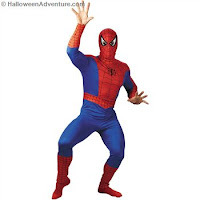 Mimic the web-slinging Spidey in our wide range of Spiderman costumes. Start with the basics with our Spiderman Comic TV Movie Superhero Costume. 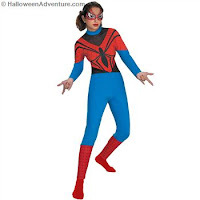 This is an officially licensed Spiderman costume includes a form fitting blue nylon bodysuit with zipper in back, and foam front Spiderman full over-the-head hood with eye holes, two small nose holes, & ties in back. It features traditional Red accents with Black web detailing around arms, chest, waist, bottom of legs and hood. Go a step further (or should we say a swing further?) with our Spiderman Deluxe Muscle Movie Costume. This getup includes an intensely believable muscle chest and muscle legs to make you resemble the superhero you’ve always wanted to be. Spider-Man Deluxe Muscle adult costume includes jumpsuit with muscles in legs and torso, and character hood. We’ve also got a Spiderman Deluxe Muscle Costume in black, if you’re looking for an irregular color scheme. This costume helps you blend into the darkness of the night, and is perfectly for scaling the sides of buildings. Black-Suited Spider-Man 3 Deluxe Muscle adult costume includes: jump suit with muscles in legs and torso and character hood. For something a bit different, try our Spiderman 3 Venom Adult Costume. This one pays homage to the most recent film, and is a costume so realistic you’ll swear you’ve transplanted yourself to an LA film set, or better yet, to the city of Gotham. This Venom costume includes muscle torso jumpsuit, character hood with mesh eyes. Mimic another member of the Spiderman stories with our Spiderman 3 Goblin Deluxe Costume. Spider-Man New Goblin Deluxe adult costume includes jumpsuit with attached shoulder pads, elbow pads, belt, sword sheath, and mask. Sword and shoes not included. Teens can rock our Spidergirl Teen TV Movie Costume, a fabulous Blue & Red character bodysuit with Black spider accent and webbing, and a deluxe spider-jeweled vinyl eye-mask. This costume is badass with just a hint of sass.